Johanna Elisabeth Zwar was born at Ebenezer [12th July 1869], then about a year on the farm at St Kitts before the family moved to Appila where she grew up. 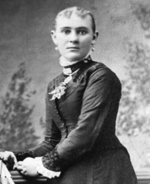 She married Christian Johannes Koch on her 20th birthday. 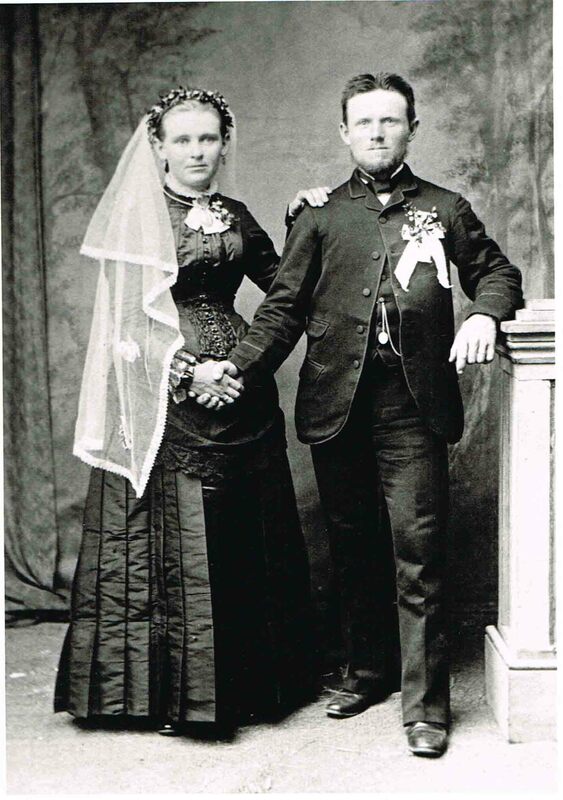 Johannes later said for him it was love at first sight, and he’d vowed to claim her as his wife. Elisabeth’s father Peter obviously approved and the day of their wedding was only the third time that the young couple had personally met. Elisabeth’s father Peter was able to arrange finance for them to purchase an 80 acre block of land from Samuel Krause with a modest home on it at Duckponds, Moculta, in the Barossa Valley. As opportunities arose they were able to purchase more land, and in 1906 they substantially renovated and enlarged their home to cater for their growing family. They were blessed with four sons and five daughters. One daughter died when only three years of age. The children were all born in the family home attended by Elisabeth’s mother as the mid-wife. (Her mother was a noted mid-wife and she would go from Appila to the Barossa for the birth of each of Elisabeth’s children). Homeopathic was the only medication she ever used. She retained her own teeth. She was never hospitalized and died in the family home where she had been nursed by her daughters. Elisabeth was gifted in woodwork as well as needlework and sewing. She was also skilled in soldering and metalwork. She did the family mending, especially the men’s work trousers right up to shortly before her death. She would do all the family shopping and bought most of her goods from hawkers and the local store at Moculta which would call for the orders and then deliver. Her family recalls that on one occasion a young man working for the local store called wearing khaki shorts. She indignantly told him that if he wished to retain her as a customer he would need to present himself in a more respectable attire! She herself was never known to wear any other than ankle length skirts gathered at the waist and nothing shorter than elbow length sleeves. Her hair was always worn swept up in a bun at the back and another bun on top of her head. She enjoyed eating raw vegetables, including potatoes as she prepared them for meals. Grandmother Elisabeth spent many hours seated in the small room known as the porch with her feet resting on a little footstool picking feathers. She sold these by the bagful. She had made a snug-fitting lid of cardboard for a square kerosene tin with a slit in the top. Through this she poked the quills and the remains of the feather were gathered in a large apron tied around her waist and spread on her lap. These were then carefully transferred into bags made of closely woven cloth. Grandmother chopped most of the firewood and carried it by big armfuls to the kitchen. She would also be in charge of the smokehouse when metwurst, hams and bacon were smoked, and would mend the mens’ work boots and the family shoes. Nothing was ever discarded if it could be mended. Wooden clothes-pegs when broken were mended neatly with wire wraps, and cups with missing handles were fitted with twisted wire handles, as many of these items were hard to procure during the world wars and the depression years. I never recall grandmother milking cows as she had three daughters and was almost 70 when I was born. My father rarely dwelt on the past but when prompted he would tell with much amusement the situation that arose during one of the visits of Grandfather Peter Zwar. Peter apparently had taken offense at something Elisabeth had asked of him and swung into one of his bad moods and announced he was leaving so packed his bags and declared he would walk to the Angaston Railway Station. Johannes was out at work and Elisabeth pleaded he wait ‘til she was able to harness a horse, but he refused. Martha and Sophie, the two oldest children, aware of the situation, delayed him by hiding amongst the bags of grain and chaff in the barn as he insisted on saying goodbye to them before he left. By the time they appeared the horse was harnessed to the sulky and Elisabeth was saved the embarrassment of having him seen walking to Angaston. He then announced that he would wait ‘til the next day so that Johannes could take him. Elisabeth was able to converse in Wendish with her father and taught her children to count in Wendish. Her German was tinged with a slight accent possibly due to her Wendish background. Grandmother was not noted for openly showing her affection and her grandchildren were expected to be on their best behaviour in her presence, but she always thought of them and gave them gifts for their birthdays and at Christmas, but cuddles were just not her forte. I cannot recall ever sitting on her lap. Christmas and big family gatherings remain foremost of my memories of Grandmother Koch. With three unmarried daughters at home she no longer needed to do much of the hard physical work. Sundays she put aside all chores and I can remember her telling me not to pursue my love of knitting and needle-work on a Sunday, as that was considered work. After the Christmas Eve church service we always went around to Grandmother’s and after some kuchen [German cake], homemade beer and raspberry cordial, Grandmother would lead the way into the lounge where a Christmas tree stood with burning candles. A round table in the centre of the room was covered by a heavy maroon cloth with tassles around the edge draped over a great pile of gifts and parcels of brown paper. We would then sing ‘O Tannenbaum’ (Oh Christmas Tree). When we were all orderly seated and asked if we’d been good she would fold back the cloth and proceed to give everyone their parcels. I particularly remember one Christmas when our family gave her some canaries. We as children were so excited about keeping this secret and she, not knowing what was in the shoebox, opened it rather quickly, allowing the birds to escape in fright, landing on whatever perch they could find – picture frames, ornaments and the Christmas tree with its burning candles. For a moment it was chaos! She simply sat and laughed while everyone else joined in retrieving the exhausted birds. She fondly cared for the birds and after her death they suddenly multiplied, prompting her family to assume she had collected the eggs to limit their numbers. When we were attending primary school we were expected to ride home via the Duck Ponds (adding another extra three miles to our four mile journey to school) to take her the daily paper and mail. Grandmother would keenly read the Advertiser with the aid of a magnifying glass. For our efforts we’d be given a cup of cocoa and some biscuits or cake, some lollies (mostly licorice allsorts and jellybeans) and one penny for our money box). On one occasion I remember Grandmother being home on her own. She proceeded to make me a cup of cocoa as usual in an enamel mug. I have vivid memories of her with her laboured walk going to the kitchen cupboard with its wire gauze sides to get a jug of milk. The milk had been scalded so had a skin on it which slipped into the cocoa. The dismay must have shown on my face but I didn’t dare object for fear of being told not to be fussy. She must have read my unease and to my utter amazement went to the drawer at the end of the big table, pulled out a tea strainer and removed the offending scalded cream. I thanked her and she actually smiled and confided to me that she never cared for having scalded milk skin in her cocoa drink. That shared moment has remained with me to this day. It also showed me that despite her often hard exterior she could also be warm inside. I was only 10 ½ years old when she died at the age of 80 years, so my recollections of her are of her latter years. After Grandfather’s death in 1945, Grandmother often spoke of her wish to be reunited with him in eternity. She was only bedridden for a relatively short period prior to her death. Dr Dreuer from Angaston was called and this was the first time that she ever consented to having a doctor attend her. I can remember as a family visiting her in bed and with some apprehension clasping her feverish hand as we left. Our last visit, I recall, was a gathering of all the family with Pastor Theo Hebart giving her communion and we all joining in the Lord’s Prayer. The undertaker came to the home and placed her in the coffin which then rested in the lounge room until the funeral. It was there that the relatives, members of the congregation and district people were invited to a viewing prior to the commencement of the funeral service. After a short service at the home a cortege made its way to the cemetery for the commital, followed by a memorial service in the adjoining Gnadenberg Church. Friends and relatives then returned to the Family home and quite a lavish afternoon tea was served. My mother, knowing I enjoyed baking, encouraged me to make some macaroons as my tribute to Grandmother. I also remember wearing a black hair ribbon and meeting Great Uncles and Aunts and cousins of my parents from York Peninsula and Appila and Wirrabara and various other places. I also recall feeling somewhat bewildered at how my aunts who had appeared so grief-stricken during the three services could now so freely laugh and share jokes with the Zwar uncles and cousins, in that large dining room, passage and kitchen. Suddenly the home that had been so sombre for days was crowded with people lustily socializing. As a young 10½ year old I figured Grandmother was safely in heaven so it was OK to laugh again and get on with living.